I love classic ice cream sandwiches and it's pretty rare that you find an improvement, but Cookies 'n Cream sound like it might just work. At the very least, it's worth a try. Let's do a quick close up. You can't really see any cookie bits on the inside. Ok, I dig in... and, yeah, it didn't work. It's not a bad sandwich, but the teeny tiny cookie bits seem to take the edge off the classic ice cream vs wafer combo. 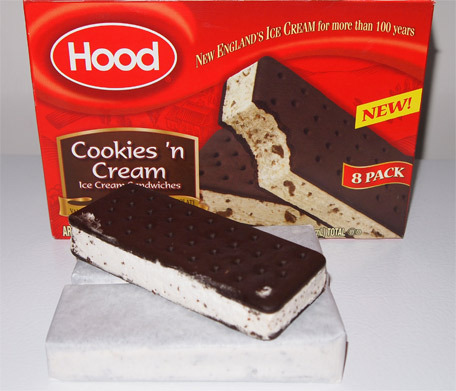 To me it just seems to taste like a muted ice cream sandwich, nothing crazy or groundbreaking here. Oh well. 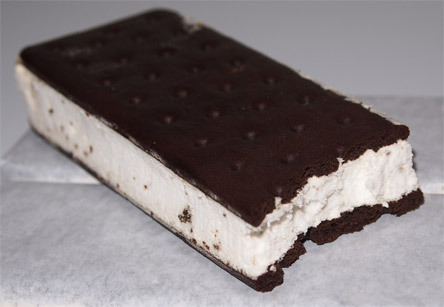 It still does the job of an ice cream sandwich, I just don't love it. On Second Scoop: As I was writing this post up, I realized the box says "Vanilla flavored ice cream with chocolate cookie pieces between DARK chocolate wafers". You know what that means? TASTE TEST!! Hmmm, you know, I kind of am getting that dark chocolate vibe. Oh, it's not strong or anything, but these definitely are a tweak from your standard wafers. It's all so clear to me now and combined with my lowered expectations, I'm ok with these now.